Continuing its alliance with Camp Conquest, Standifer Insurance Group marches on with their charity campaign in Alabama to raise donations for this year’s summer camp. The Group has raised over $3,000 for the nonprofit’s camp already and has made a commitment to reach their $4,000 goal before this summer’s Burn Camp. The camp is designed to provide a program where kids can make friends and build self confidence. Standifer Insurance Group continues their fundraising campaign for Camp Conquest, a summer camp for children and youth aged 6-17 years who have been hospitalized at the Burn Center at Children's of Alabama. The agency announced that they intend to raise $4,000 for this year’s summer camp for burn survivors. Camp Conquest has helped create long-lasting memories over the past 16 years. 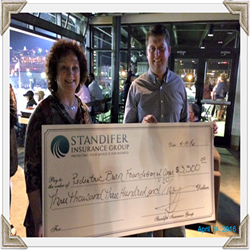 Standifer Insurance Group recognizes the importance the camp plays in the lives of these young people, and the agency has been working tirelessly for some time already to raise funds for the Camp. They have also volunteered as a team with the Pediatric Burn Foundation of America. “Camp Conquest is a 5-day summer camp for young burn survivors. Its mission is to bring children and youth together due to a shared experience, and its designed to provide a program where kids can make friends and build self confidence,” said Jessup Standifer, the Agency’s principal. The agency will promote the current campaign over the course of the next two months through its social media channels, along with through the agency’s monthly magazine, delivered to households in Alabama. Our Hometown magazine reserves a full page to feature the campaign and details of the cause. The electronic Flipbook version of the current issue can be accessed here: http://www.standiferinsurancegroup.com/Our-Hometown-Magazine_41. To join Standifer Insurance Group in supporting their charity campaign, donors are encouraged to visit the campaign page at http://www.standiferinsurancegroup.com/Creating-Cherished-Memories-For-Burn-Victims-With-Camp-Conquest_22_community_cause and also share the page with their networks. As a Personal Finance Representative in Alabama, agency owner Jessup Standifer knows many local families. His knowledge and understanding of the people in his community helps provide customers with an outstanding level of service. Jessup and his team look forward to helping families protect the things that are important - family, home, car and more. They can also help clients prepare a strategy to achieve their financial goals. To contact an expert at the Standifer Insurance Group, call (205) 664-3200 or (866) 664-3200.